The IBioIC Annual conference is now an established biotechnology conference within the UK biotech calendar and a good opportunity for industry, academia and government (known as the triple helix) to interact and direct future collaboration. This year the conference also hosted the launch of the BBSRC Phase II NIBB’s (Network Industrial Biotechnology and Bioengineering) where the UK government supports and funds the establishment of academic and industrial networks to develop innovative and relevant industrial biotechnology. The second phase of the 5 year funding will be focussed on TRA4 commercially viable products which will hopefully support longer term industrial growth in the UK Biotech industry. 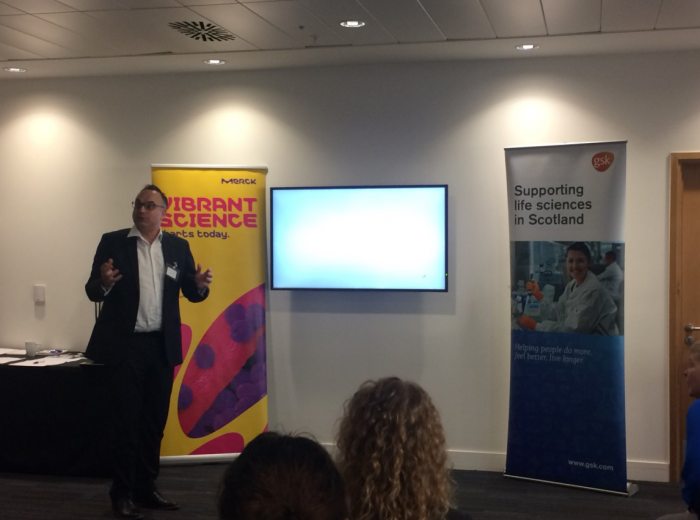 A number of fascinating topics were discussed such as the need to promote the launch of the UK National Biotech Strategy which is an industry that supports 5.2 million jobs and £32 billion turnover for UK companies. Steve Bagshaw from FUJIFILM Diosynth Biotechnologies and Chairman of the UK’s IBLF (Industrial Biotechnology Leadership Forum) spoke about the impact of developments in biotechnology, and the fact that removing 1 million tonnes of plastic bottles from the UK market would have the equivalent environmental impact to removing 1 million cars from the road. More needs to be done to promote the UK biotech industry and the impact it can have and Biocatalysts Ltd is looking to support this initiative where it can. Other interesting discussions I attended focussed on: adding value to by-products in the Scottish whiskey industry, which produces 80,000 tonnes of protein rich by-products each year; and capitalising on the blue economy in Scotland and the wealth of natural resources provided by 60% of the UK’s coastline in the Highland and Islands. There were also a wealth of new companies and new ideas which Biocatalysts can support in discovering and scaling up enzymatic products. Perhaps the most thought-provoking session was by Chris Goodall, a writer and analyst on energy transition, who proposed a hypothesis that in 2030 the hydrogen economy will be well established and delivering electricity at 5% of the current cost. He presented an argument that sustainable energy generation from wind and solar will lead to the need for hydrogen storage technology and innovating into this space should be part of future planning. Whether or not you agree with Chris’ hypothesis, it was a great challenge to end the meeting with.